On Nov. 14, the San Luis Obispo County District Attorney’s Office requested a warrant for Patty Welsh’s arrest for felony vandalism. She is currently out of jail on $20,000 bail. 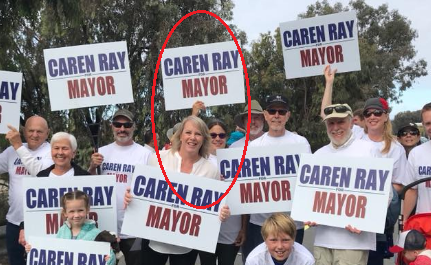 During the mayoral campaign, Welsh worked for the Ray campaign asking businesses and residence to put up Caren Ray for mayor signs. 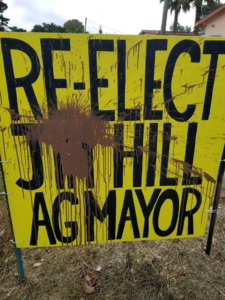 On Oct. 9, Welsh allegedly drove around Arroyo Grande tossing Christmas ornaments filled with brown paint at Jim Hill for mayor signs. During her rampage, Welsh also allegedly damaged the property of businesses and people who promoted Hill, Ray’s opponent. Witnesses told officers Welsh had threatened to steal Hill’s signs, according to court records. Earlier this year, Welsh was charged with misdemeanor vandalism regarding a separate incident in Arroyo Grande. On May 28, a woman returned to her car which was parked on Pradera Court in front of a side gate to Welsh’s backyard and found her tire had been slashed and a message written on her windshield. “Thanks for blocking my entrance” the message said. Welsh admitted to officers that she was angry because she had to carry items she was taking to her backyard further because of the parked car. While Welsh took credit for the writing on the windshield, she denied slashing the tire, according to the police report. A claim officers did not believe. Welsh is scheduled for a Dec. 4 trial setting conference for the tire slashing incident. Caren Ray and Patty Welsh marching in the Harvest Festival Parade. In 2016, while Welsh was working on the Hill for Mayor campaign, a homeowner spotted Welsh pilfering a city council candidate’s signs. Members of the Hill campaign told Welsh to return the signs, but Welsh refused to comply, and she was removed from the Hill campaign, according to text messages. Welsh then became a vocal opponent of Hill. In 2017, Welsh accused Hill of Brown Act violations, charges Ray used to mount an investigation that cost tax payers approximately $100,000. While the investigators determined Hill had not violated the Brown Act, they found that Hill had shared his government email password with his wife. In the Nov. 6 election, Ray won the mayor’s seat with 4,782 votes to Hill’s 4,250 votes. How incredibly childish, fill a Christmas ornament with brown paint and toss it at the signs? Kind of like egging a hose at Halloween. What is this woman, stuck in 8th grade? She should get at least a $1,000 fine, six months in jail and pay restitution. But I predict, probation, a $100 fine and no restitution — if even that. You play, you pay. She’ll be alright in the big house. She can join the Team Adam Hill prison gang and get a teardrop tattoo. Keep up the good work, Dow. Hey you just hit Caren Ray’s new slogan at city hall, but it is “You pay, you play”. This is a lot worse than just vandalism, this is trying to suppress someone else’s free speech, a Civil Rights violation! The Tony Ferrera regime ended only to be continued by the ruthless Caren Ray. Get ready AG, years of corruption, mismanagement, and other scandals will follow. You get what you voted for. Nick Tompkins can hardly wait for Ray to take office, he will again be able to deal millions of taxpayers dollars his way in exchange for crap buildings. Plus still no construction of the commercial space on his Courtland development and there is a good chance now it will not happen for sometime. We’ll get to look at a dirt lot, nice welcome picture to our city, thanks Nick. Nick is looking for more screwy deals like the city’s city hall swap deal which cost us millions. There’s a for sale sign on Courtland/Grand. Howover will Princess Barneich collect the penalty she promised was going to ensure Tompkins developed the site in a timely manner? Tompkins must have laughed his @ss off all the way home after she served up that softball. The only right thing to do, for all involved, is to throw the book at her with additional punishment for her part in a hate crime. The election is no excuse for this public display of hate, acted out with physical damage. There should never be a reward in connections with this behavior and this must never be dismissed. The election process is all about a civil action that all can participate in. Ok, now let’s handle the Bill Worrell/IWMA issue, Dow. This what happens when someone is part of the good old boy group. I hope that this is the beginning of getting SLO cleaned up? Well Happy New Year Arroyo Grande. You asked for it and now you have it. Shold be a good ride for the next 4 years. Mayor is two year term but we won’t get rid of her that easily. She’s got backing from Hill, Black and the rest of the progressives. 2 is certainly better than 4 although I fear that irreversible damage may happen. The search warrant was requested on October 17th. Surely the arrest could have come well before November 14th! This was not a complicated case, EVERYONE knew ‘who done it’ before the paint was dry on October 9th. How much did politics play in the process of this investigation? Who slowed the arrest to come after the election? Would it have mattered in the outcome? Maybe. Maybe not. But, to have had a thumb on the scale will have the voters wondering throughout Ray’s term and the elections legitimacy will remain in question. Ray failed to call for the arrest. Failed to call out Welsh. Failed to even reach out to the Mayor to see if she could help find the culprit or let Hill know she was sorry that his property was damaged. What does this say about her as a leader? Speaks volumes to me. I hope the victims in this case; including city property, gets full restitution and hope the judge throws the book at Welsh. What does the city’s $ claim add to the damages? Have they filed one on behalf of their citizens? With Ray as Mayor, will they? 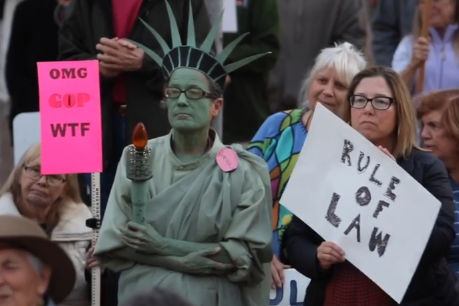 Oh and the irony of Welsh wearing a Lady Liberty costume doesn’t go unnoticed. She is a hypocrite to the core. She stands with those who hold 45 accountable, yet isn’t accountable herself. What does it say about Ray as a leader? More like: What does it say about Ray as a PERSON? Not much, I believe. If she had been arrested before the election it would have been seen as “Undue influence” on an election. You can’t have informed voters if you want to win.